Solar photovoltaics (solar PV) is used to generate electricity in over 100 countries, and its recent surges in development have made it the world's fastest growing power-generation technology. Though solar PV currently accounts for only a small fraction of the world's total power-generating capacity, if its expansion persists, that is likely to change. The technology converts sunlight directly into electricity with the use of solar panels made up of semiconductor material. On the household, business, and institutional level, roof and/or wall mounted installations, as well as Building Integrated Photovoltaics (BIPV) have gained considerable popularity in converting buildings into net energy producers. Historically in Canada, PV systems have been used mostly in remote, off-grid locations to provide power for road signs, lodges, farming, and telecommunications. The past several years have seen a drastic increase in utility-grid systems of about 30% annually since 2008. 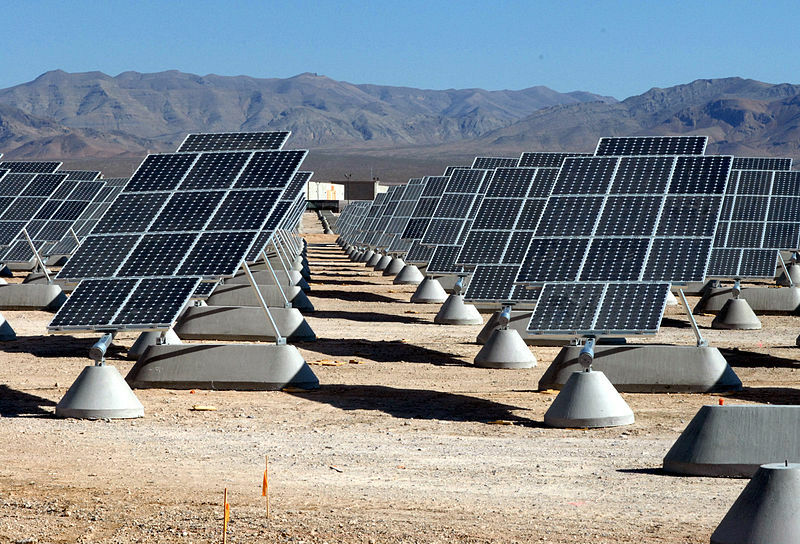 Solar PV power plants are also on the rise, both nationally and internationally. Canada, though not in the running for top PV installed capacity, does host the world's largest PV power plant in Sarnia, Ontario. The province's feed-in tariffs (FIT's) have motivated expansion from the household to the industrial level. Globally, PV industry growth has coincided with the implementation of government incentives. Policies and programs aimed at facilitating PV project development are essential. In no way can BC expect to see the industry grow without similar program assistance. How Do Solar Photovoltaics Work? 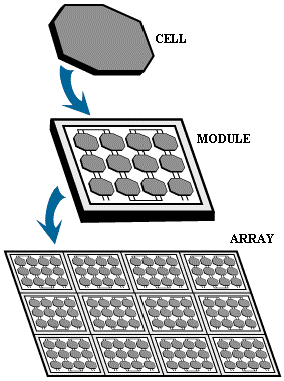 Diagram of a Photovoltaic Array. Photovoltaics (PV) uses the technology of photovoltaic cells to convert solar energy directly into electrical power. PV cells are like the building blocks of a photovoltaic system. Also known as solar cells, these electricity producing devices may be very small (the size of an eraser) or as large as several inches across. When many cells are connected together, they form modules, which can in turn be combined to form PV arrays. Generally, the larger the area of the module or array, the more electricity will be produced. In this way, photovoltaics can be used on a wide range; small cells can be used to power watches and calculators, while on the larger end, masses of arrays are used in power plants to generate electricity. The technology relies on the photovoltaic effect; photons of light knock electrons into a higher state of energy, which creates electricity. When light shines on a PV cell, the absorbed energy is transferred to electrons in the atoms of the PV cell, which is constructed of a semiconductor material, usually silicon alloys. Having been energized, the electrons break free from their normal positions in the atoms, and become part of the electrical flow, or current, in an electrical circuit. A special feature of PV cells is a built-in electric field which provides the voltage required to drive the current through an external load, like a light bulb. Photovoltaic cells produce direct current, which can be used where low energy is sufficient. Direct current can, and often is, converted to alternating current (AC) using inverters. Alternating current is compatible with electricity supplied from the grid, and can be used for anything— from powering blow-dryers to computers. A 2006 report commissioned by CanSIA placed solar PV in the 15-17% efficiency range. A significant downside to PV systems is their inability to store electricity at a comparable efficiency to other energies. In remote, off-grid locations, batteries are sometimes used to store electricity. For most on-grid systems, excess energy is fed back into the local utility, in some cases neutralizing utility bills. The lack of sufficient storage technology means that during the night, as well as periods of reduced radiation, PV systems are largely ineffectual, and depend to a large degree on back-up systems. Solar thermal systems, on the other hand, can store great amounts of heat energy until it is needed. When installed on rooftops and walls, photovoltaics can change buildings from energy suckers to energy producers. Generally, solar cells are installed on rooftops that would otherwise consist of empty space. A different approach that still uses the principle of PV systems, incorporates photovoltaic materials into roofing, siding, and windows. In these Building-integrated photovoltaic systems (BIPV), cost is decreased as the photovoltaic materials substitute conventional materials rather than adding on to them. Secondly BIPV installations are generally thought to be more aesthetically pleasing than roof-mounted PV structures. Both designs facilitate on-site energy production which eliminates transmission from an alternate source. Photovoltaic systems cannot account for a building's entire energy consumption. Depending on the building's energy requirements (and potentially they can be reduced) photovoltaics can cover more or less of the total energy consumption. Buildings may receive on or off-grid electricity. In an on-grid set-up incorporating photovoltaics, owners can supplement energy needs with electricity provided by their local utility when their PV systems cannot generate enough energy. This back-up is particularly important at night, and during periods of cloudy or overcast weather. Being hooked up to the grid also means that any surplus electricity produced by the PV system will be exported from the building to the local utility. For off-grid locations, (typically remote areas where there are no power lines) PV system users have no means of tapping into back-up power. Off-grid photovoltaics sometimes power households, but generally are used in other applications, such as powering electric fences, water pumps, traffic warning signs, campgrounds, offshore drilling platforms, weather stations, and communications equipment such as emergency roadside phones. Storing electricity from PV cells can be accomplished with the use of batteries. Deep cycle batteries are ideal, though car batteries can be used at a decreased level of efficiency. Deep cycle batteries are either lead acid (which require routine additions of water) or captive electrolyte (which are maintenance free). There exists some concern over the disposal of such batteries when they are no longer effective. 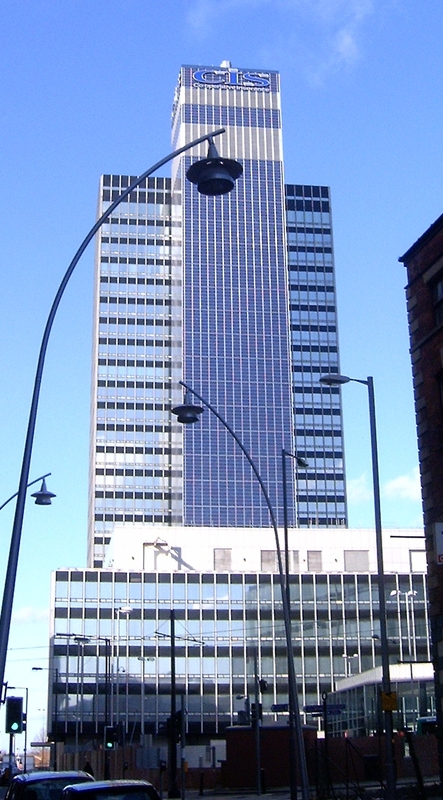 Massive PV System integrated into the side of an office tower in Manchester, U.K.
PV systems require proper — though not complex — wiring, safety switches and fuses, controllers to prevent batteries from becoming overcharged or grossly discharged, diodes to permit the current to flow in the right direction, and finally, grounding mechanisms to counter the risk of lightning strikes. How Do Photovoltaics Work at the Power Plant Level? Compared to solar thermal power plants, photovoltaic power plants are fairly straightforward. Multiple solar arrays are strung together onto a mounting system from which all individual solar cells collect energy and convert it directly into electricity. The electricity goes straight through the system's wiring and is injected into the electric grid. PV power plants are currently overshadowed by solar thermal plants, as the latter are far more efficient at producing large scale electricity, and can also store large quantities of energy, where PV power plants cannot. Technology is always changing, however, and it's possible that PV may become a larger energy contributor in the future. Where Can Small-Scale Photovoltaics Be Used? In varying degrees of efficiency — pretty much anywhere. As with solar thermal's geographical dispositions, PV systems rely on the amount of solar radiation received to determine how successful they are at producing energy. Portions of energy can be covered by photovoltaics in any region of the earth. Though with modules operating at about 15% efficiency in converting sunlight to electricity, systems will reward their users much more in sunny climates. This means that locations at low latitudes, largely within the tropics, are well suited to using PV systems. Where Can Photovoltaic Power Plants Be Developed? Photovoltaic power plants can be developed anywhere in the world, with the major requirement being an enormous amount of land. The land mass required for utility-scale solar power installations is enormous, and plants are usually located far from urban areas, requiring upgraded or replacement of existing transmission lines. Approximately 12,160 acres of land are needed to support a 1,000 MW photovoltaic plant. A suggested solution to the massive land requirements, is to site solar plants on marginal agricultural land. Such action would replace economically low-value activities with higher value ones. The Solana Generating Station in the U.S. is a good example: The proposed plant, which is currently undergoing construction, will reallocate over seven square kilometres of land that had formerly been used to grow alfalfa. The solar plant is expected to consume 75% less water than was required to grow the alfalfa. The Solana Generating System is a solar thermal plant, a type of solar plant that uses considerably more water than a photovoltaic plant does (though it operates at a significantly higher economical efficiency). The obvious question: If solar plants are replacing agricultural lands, what will happen to farms? The reaction of farmers to a proposed 30,000 acre solar plant in California has been positive. The plant will use fallowed agricultural land, a reallocation that will reduce water demand and ensure superior water distribution among the active farms in the region. First nations' lands constitute a somewhat controversial possibility for siting solar plants. In the United States, Congressman Raul Grijalva estimated in a 2007 hearing, that "the solar power potential of tribal lands was roughly 4.5 times the annual electricity needs of the United States". In 2005, an implemented Energy Policy Act granted federal agencies the authority to "institute preferential purchase agreements for any 'energy product' or 'energy by-product' produced by business entities that are majority-owned by an Indian tribe". The act was, according to Theresa Rosier, "intended to provide support to tribal governments in the development of energy resources on Indian lands... to provide incentives for partnership with tribes that want to develop their resources [and to] authorize individual Indians and tribal governments to enter into energy development leases or business agreements without Federal review..." It is possible that with the many permitting issues stalling solar developments in the United States, projects proposed for tribal lands could provide a smoother avenue for development. Another view of the solar PV power plant built outside of Nellis Air Force Base in the Nevada Desert. Similar interest in tribal land for the purpose of solar plants exists in Canada as well. The suggestion, in some areas, has been met with optimism. Chief Gordon Plains of the T'Sou-ke Nation on Vancouver Island said: "It's good to be a part of using the gifts that the creator gave us in helping us to take care of Mother Earth. It is now appropriate that first nations take the lead in demonstrating how to live without fossil fuels once again." Historically, resources from Native lands have often been exploited unfairly and irresponsibly. It seems that native leaders are prepared to embrace energy projects so long as the development and ensuing operation is carried out with the well-being of the environment and local communities in mind, ensuring that the benefits are shared between all parties. What are the costs of installing PV solar panels in buildings? With a recent surge in demand, the costs for installing PV systems has reduced. Module prices have declined from $11.09 in 1999, to $3.31 in 2009, demonstrating an annual decrease of 10% over the 10 year period. The main costs are concerned with installation, both parts and labour, and replacement of inverters. Costs range depending on the size of the system. The installed price per kW for grid-connected installations is between $6,000 and 8,000. Off-grid systems with storage ring up a higher price, around $16,000 per kW. Once installed, maintenance and replacement of parts is minimal. Modules typically last for 20-30 years (almost double the life-expectancy of other generating systems such as wind, nuclear, or natural gas turbines), and the life-expectancy is only improving. A study from the Department of Energy at Berkeley's National Laboratory, says that the average cost of PV systems has declined significantly from 1998 to 2007. The study analyzed 37,000 grid-connected PV systems, and found that installed costs had declined form $10.50 per watt to $7.60 per watt. It is expected that this trend will continue. What are the Costs of Developing a PV Power Plant? The German Lieberose Photovoltaic Park in Germany. Despite advancements in technology, producing electricity from solar PV is still not cost-comparable with fossil fuels such as coal and gas. Costs vary according to size of the plant, its location, initial cost of the land, and also depend on government programs to offset some of the investment. Companies are hesitant to publicize their investments, but an estimate for the installation of a 10 MW system is between $70 million and $80 million. If that estimate holds true, the development of Sarnia's 80 MW would have cost around $600 million. The government of Ontario, who partially funded the project through feed-in tariffs, did reveal that over $400 million had been invested in Sarnia's phase two expansion, which added 60 MW to the former 20 MW. How Many Jobs Do Photovoltaics Support? The PV industry in Canada supports 2,700 full-time jobs in manufacturing, distributing, installing and consulting. This represents a 30% increase from 2008. Increased investment in Canadian universities to enlarge the level of research and development activities in the field of materials and solar cells was seen in 2009. The Sarnia Photovoltaic Power Plant in Ontario created 800 construction jobs. Indirect job opportunities also arose for design and engineering companies, service providers, suppliers and sub-contractors. CanSia. Environment Canada. Retrieved from: http://www.saaep.ca/EnvironmentalAttributesofSolarPV.pdf. 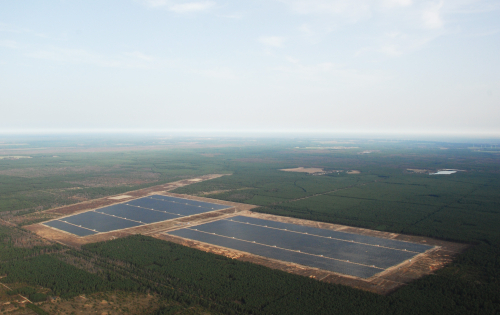 A photovoltaic power station at Okhotnykovo in the Ukraine, the fourth largest solar PV plant in the world. How do Solar PV Systems Affect the Environment? Solar PV systems avoid the contentious water issues associated with solar thermal power plants. With PV systems, there is no necessity for cooling; the only water consumption is for periodically rinsing the panels of dust and debris. The land requirements for solar PV power plants, on the other hand, are staggering. While a coal plant typically demands between 640-1,280 acres to produce 1,000 MW of power, a PV plant can require 12,160 acres to generate the same amount. Though wind power uses the most (an estimated 46,000 acres) much of it remains jointly usable for agricultural purposes, including crop plantations and grazing for livestock. Such comanagement has not been easy to implement for solar PV farms. Pollution issues with PV seem to bookend the actual operating time of the energy source. Manufacture and decommissioning account for the main environmental impacts. Though solar PV systems emit no green house gases (GHGs) during operation, their production does. PV modules are generally manufactured in countries that use high GHG emitting electricity generation. Studies put PV's GHG production at anywhere between 13-731g CO2/kWh, versus wind that sits at 7-124 g CO2/kWh. An improvement to this high percentage of GHG emissions could occur if modules were manufactured in parts of Canada where the GHG released during electricity production is fairly low. Quebec and BC are noted as good candidates for PV manufacture, as they both have relatively low carbon emissions from their electricity sectors and good supplies of raw silicon (a main material in solar panels) as well as aluminum fabrication capacity, primarily in Quebec. Once Ontario has phased out coal, it too would make an excellent low-carbon provider of clean solar PV modules. Reports estimate that GHG emissions could be reduced almost to nil. It is important to note that in general, nonrenewable emit the bulk of their GHG's during the generation stage, whereas with a renewable like solar PV, the majority of emissions occurs at the manufacturing stage. Thus, over time, solar PV would emit only periodically, when modules needed to be replaced (every 20-30 years), while a coal plant would emit constantly. 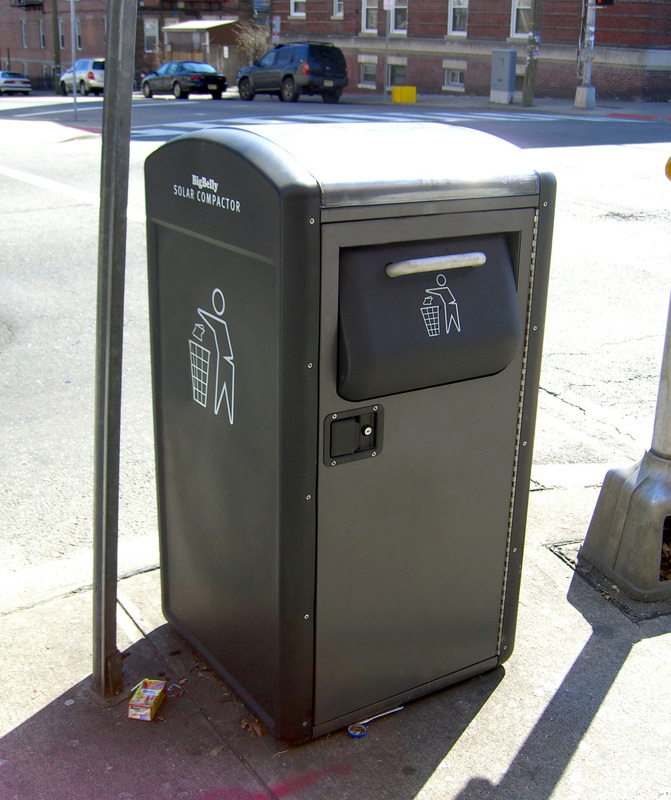 A solar photovoltaic trash compactor. These are now commonplace in Victoria and Vancouver. Once serviced, PV power plants have a very small carbon footprint. The Sarnia PV plant, for example, saves over 39,000 tonnes of CO2 annually, according to owner Enbridge. The results of a 2006 CanMET study state that 46% of Canada's residential electricity consumption could be provided by BIPV systems. An estimated 73,000 MW of BIPV systems could be installed on Canadian buildings, and avoid about 23 megatonnes of greenhouse gases. The long life of PV modules, and the fact that they are only recently taking off, means that little research has gone into PV panel disposal or recycling possibilities. It is anticipated that many materials can be recycled, including the aluminum frames, though there is concern regarding heavy metal leaching that could exceed environmental limits. 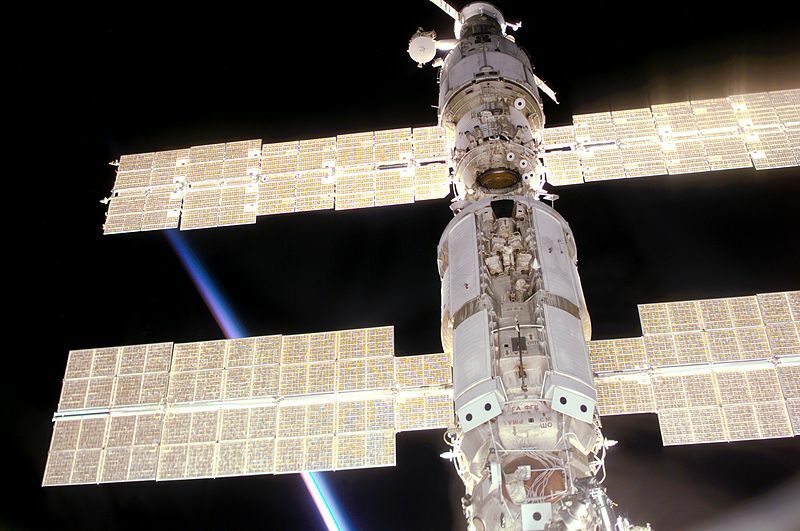 Russian-built solar panels on the International Space Station. Space agencies played a huge role in the initial development of PV technology and continue to rely heavily upon photovoltaics. As mentioned above, Ontario has set the example as far as government incentives go. FIT's (feed-in tariffs) have stimulated investment in various renewable energies, including solar photovoltaics. The program is separated into two branches: microFIT for systems under 10 kW in size (household or businesses) and FIT, for larger, utility scale projects. Enbridge, current holder of the Sarnia power plant, sells the power output of the facility to the Ontario Power Authority, as per a 20-year agreement under Ontario's Renewable Energy Program. If BC wants to advance its use of PV systems, government incentives will be essential. As with most renewable energies, start-up costs are substantial, and without government assistance, progress in the PV field will remain slow. 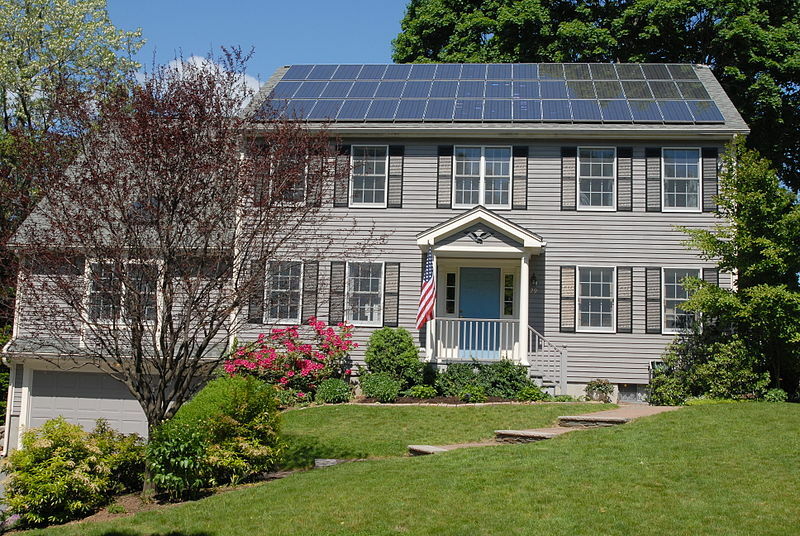 The long-term payoffs for PV systems, both economically and environmentally, are significant. PV installations can operate for many years with little or no maintenance, so after the initial set up cost, operating costs are extremely low compared to conventional power technologies. As time passes renewable energies will inevitably get cheaper while fossil fuels will get more expensive. Since 2008 the price of PV modules per MW has fallen by 60%, putting solar power in a position to be competitive with the prices of retail electricity in a number of sunny countries. In grid-tied PV systems the electricity produced can reduce or eliminate the use of grid electricity during peak hours of operation (during the day). This advantage requires a time-of-use meter, which may not be available to some users. Grid-tied PV systems also reduce the amount of transmission losses that occur as a result of transmission of electricity over long distances. Compared to fossil fuels and nuclear energy very little research money has gone into the development of PV technology so there is considerable room for improvement. Efficiencies are rising while production costs are rapidly falling, meaning PV is becoming an increasingly viable electricity source. One of the main disadvantages of PV is that it is more expensive than fossil fuel energy, mainly due to the cost of manufacturing PV equipment and the low conversion efficiencies of PV arrays. In the future costs of PV equipment will decrease and arrays will become more efficient making PVs more cost effective. A system visualized by the U.S. Government for combining solar and wind power, and batteries, in order to provide constant power to a grid. Another disadvantage of PVs is that solar power relies on an intermittent energy source. This could lead to energy shortages if too much of a region's power comes from PV. This is a problem shared with wind power, and is known as the intermittency problem. As more wind and solar technologies are employed, and utilities become more experienced at integrating them into the power systems, the problem of intermittency appears less central than once appeared. Read the EnergyBC article explaining strategies for dealing with intermittency here. Rapid growth is expected for photovoltaics, partly due to the decreasing costs of installation of a PV system. Installed costs have decreased from an average of $10.50/watt in 1998 to $7.60/watt in 2007, a decrease of ~$0.30/year or 3.5%/year. Since then cost of solar PV panels (not including the cost of installation) has plummeted dramatically. As the Economist noted, "In the past four years their average cost has fallen by more than 75%. At less than $1 per watt of generating capacity, solar is now the cheapest power source in some sunny places... This is starting to look like a revolution." Feed-in-tariffs (FIT) are another reason that growth can be expected in PV energy production. FITs require energy companies to buy renewable energy from private producers and set the price per unit of electricity that the company must pay. These laws accelerate the uptake of renewable energy in grid-tied areas by making a PV system a more sound investment. The growth of PVs is reliant on policies like this to reduce the cost and risk to the investor. Herwig, L.O., 1974, Report on photovoltaics research and technology in the United States, Photovoltaic power generation; Proceedings of the International Conference, Hamburg, West Germany, September 25-27, 1974. Total global PV installations amount to nearly six times what they were in 2004. In 2010, Germany more than tripled the runners-up for top PV capacity, accounting for 47% of existing global solar PV capacity. Spain came in at second with 16%, Japan in third with 13%, and the US in fourth with 6%. The Renewable Energy Policy Network for the 21st Century (REN21) 2010 Global Status Report recorded more than 3,200 large-scale photovoltaic power plants (also known as "utility scale") 200 kW and larger installed worldwide, with a combined capacity of 5.8 gigawatts. This was around a quarter of the global PV capacity. That's more than five times the 2007 capacity. A 2009 study noted that periods of rapid development paralleled years when favourable subsidies were available, particularly in Germany, Spain, South Korea and the US. The remaining three quarters of global PV capacity came from the three million households and businesses that retrieved power from solar PV systems worldwide. Despite the higher costs of opting to develop a photovoltaic plant over a solar thermal plant, the PV industry is growing. The advantages of a PV system over a solar thermal one, include the minimization of water consumption (its only really for washing the solar panels) and the direct conversion of sunlight to electricity eliminating bulky, and costly, equipment. 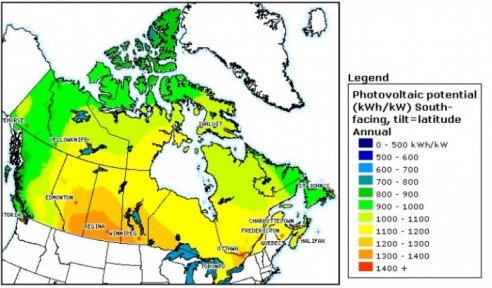 A map provided by CanMet showing the solar potential of Canada's various regions. In 2009, Canada's total PV power installed capacity jumped from 32.72 MW in 2008 to 94.57 MW. The grid-connected market grew to account for 87% of the market, a development owed primarily to Ontario's new feed-in tariff. The top module manufacturing companies in Canada include Day4 and Centennial Solar. Are There Any Solar Photovoltaic Power Plants in Canada? Canada hosts the world's largest photovoltaic power plant in the world. Sarnia Photovoltaic Power Plant in Ontario puts out 80 MW — enough energy to power over 12,000 homes. In 2010, the new owner Enbridge upgraded the solar farm to 1.3 million solar modules covering an area of 943,000 square meters, or about 600 soccer fields. Several other projects are in various stages of development in the province, some hoping to challenge Sarnia as the world's largest PV plant. Ontario's adoption of solar PV technology is reflected in the province's implementation of the FIT (feed-in tariff) program in 2009 which alleviates costs for industrial and household scale renewable energy projects. Ontario's feed-in tariff program is a comprehensive guaranteed pricing structure for renewable electricity production. It includes rules, prices and contracts for anyone interested in developing a renewable energy project. The Feed-in tariff program is separated into two branches: microFIT for systems under 10 kW in size (household or businesses) and FIT, for larger utility scale projects. None of Canada's other provinces have announced plans for PV solar plants. It is possible that after Ontario's success, other provincial governments may implement similar incentive programs to boost development. Do BC's Residents Have Rooftop Solar Panels? Historically, solar thermal systems have dominated over PV systems, on the household and institutional level. However, as technology improves performance and lowers costs, PV systems become more common. Journalist Colleen Kimmet interviewed Kevin Pegg, president of Alternative Energy, a Victoria based renewable energy supplier. Pegg explained (read article here) that a shift has occurred in his PV system clientele. With once solely off-grid clients, he now has an increased amount of urban residents looking for systems as well. Solar hot water and solar space heating systems still outnumber PV systems, though it is anticipated that both will grow in coming years, complimenting each other across the province in a variety of applications. Does BC Have Any Solar PV Power Projects? BC doesn't yet compare to Ontario in terms of exploitation of the sun, though the industry is growing. Just west of Victoria, the T'Souke First Nation community employs three photovoltaic systems. The systems emit a combined total of 75 kW, tiny when put beside Sarnia's 80 MW, but significantly greater than any other project in BC. The implementation of government incentives could accelerate the expansion of PV technology in BC. At present, the provincial government does provide some rebates for renewable systems, though they are most common for solar hot water, with little mention of PV electricity systems. "Advantages and disadvantages of photovoltaics," Centre for EcoTechnology (CET). 2011. Accessed May 31, 2012. Chidley, Dave., "Clean Energy fact Sheet." Clean Energy BC. Last modified 2010. Accessed May 31, 2012. "Cost Of Installed Solar Photovoltaic Systems Drops Significantly Over The Last Decade." DOE / Lawrence Berkeley National Laboratory. ScienceDaily (March 3, 2009). Accessed May 29, 2011. "Enbridge and First Solar Agree on 60 MW Renewable Energy Expansion at Sarnia," Marketwire, 2009. Glennon, Robert and Andrew Reeves. "Solar Energy's Cloudy Future." Arizona Journal of Environmental Law & Policy. Vol 1:1 (2010) 91. Accessed May 31, 2012. Hamilton, Tyler. Ontario goes solar. The Star (Published April 26, 2007). Accessed May 31, 2012. Herwig, L.O. ‘Report on photovoltaics research and technology in the United States.’ Photovoltaic power generation; Proceedings of the International Conference, Hamburg, West Germany, September 25-27, 1974. Kimmet, C., "Can BC Make Solar Bloom?" The Tyee. July 15, 2008. Accessed May 31, 2012. Knier, G., 'How do photovoltaics work?' NASA, 2002. Accessed May 30, 2012. Kropp, R., Solar Expected to Maintain its Status as the World's Fastest-Growing Energy Technology, SRI world group. 2009. Accessed May 30, 2012. Lenardic. ‘PV Resources.’ (2009). Accessed May 2011. McMonagle, Rob. 2006. "The enviornmental attributes of solar PV in the Canadian context." CanSIA (July 2006). Accessed May 31, 2012. ‘What is the Feed-in Tariff Program?’ Ontario Power Authority. Last modified 2010. Accessed May 31, 2012. "Overview of the Canadian Solar PV market activity." CANSia. Last modified 2011. Accessed May 31, 2012. "PV Electricity & Solar Resources Assessments," Canmet Energy (2011). Accessed May 12, 2011. "Renewable energy costs drop in '09," Reuters, November 23, 2009. Accessed May 31, 2012. "Renewables Global Status Report." Renewable Energy Policy Network for the 21st Century (REN21)— 2011 report. Accessed May 31, 2012. 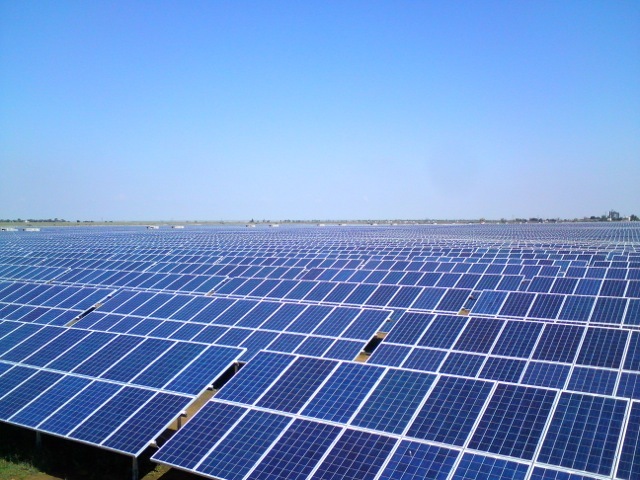 "Study Sees Solar Cost-Competitive In Europe By 2015," Solar Cells info. Posted Oct 16, 2007. Accessed May 31, 2012. "Transmission And Distribution Technologies," U.S. Climate Change Technology Program. (November 2003). Accessed May 31, 2012. "What is Solar Photovoltaics (PV)?" Canadian Solar Industries Association (CanSIA). Last modified 2011. Accessed May 31, 2012.